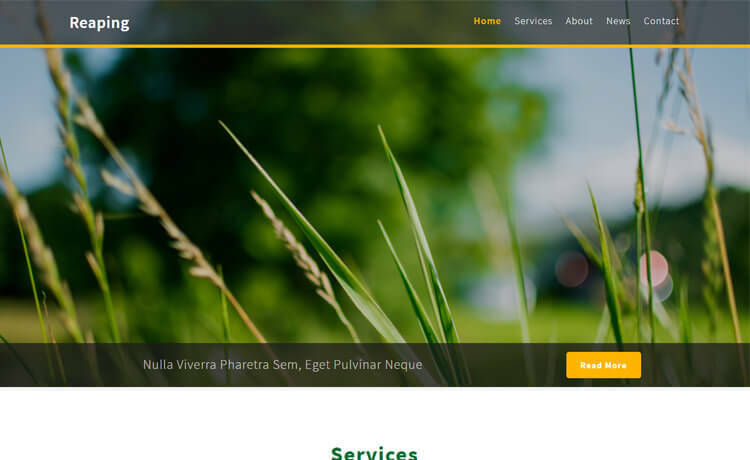 Reaping is a free HTML5 Bootstrap 4 agriculture website template. It comes with cutting-edge features and assets like hero header, call-to-action button, footer widget, contact form, etc. Reaping is a free HTML5 Bootstrap 4 agriculture website template. It has a brilliant design with an attractive look. Reaping fits into websites like gardening, firming companies, agricultural startups, small agricultural business, and other similar kinds. Moreover, it is a single-page and fully responsive site canvas with cross-browser compatibility. Besides, it comes with cutting-edge features and assets like hero header, call-to-action button, footer widget, contact form, etc. Reaping has an intuitive and well-organized code structure inside the box to guide you while customizing the theme. Create with Reaping and enjoy creating. Thank you for downloading Reaping.